Tate Britain is currently running an exhibition called Migrations, which explores how British art has been shaped by successive waves of migration, tracing not only the movement of artists but also the circulation of ideas and visual languages. In addition, it demonstrates the rich diversity of immigrants and an aspect of the exhibition focuses on Black Britain, showing the influence of immigrants of African descent on the ethnic mix on the British society. This include West Indian men and women of the “Wind rush Generation” from 1948-1960s, who contributed immensely to the British workforce, especially in industries such as the London Transport and the National Health service. Not only did they face rabid institutionalised racism but these Black folks also faced hostility within the labour market, and as a result these Afro-Caribbean communities had high unemployment rate in post-war Britain. But the arrival of these newcomers changed the urban geography and fuelled the British economy, and the Black communities contributed immensely to British cultural life. The exhibition showcases the works of artists in pursuit of an international language as well as artists from the British Colonies who came to invest in a range of academic fields. The importance of these early periods can be seen in the paintings of British-Guyanese painter Frank Bowling. Bowling's image of his mother‘s grocery store in Guyana indicates the importance of personal memories in the formulation of artistic language. The map of Guyana reveals an engagement with political subject matters. It also includes the Black British Audio film Collective Hans worth song 1986 - a film that deploys hybrid representations of the early 1980s race riots against the repressive police measures in the working class migrant areas of Birmingham. Hansworth song was meant to be finished for the third cinema conference in Edinburgh but wasn’t ready, so the first screening was at the Birmingham Film Festival, The key aspect of this film centres on a lyrical and poetic meditation on the traumatic aftermath of inner-city riots across London, Liverpool and Birmingham in the 1980s. 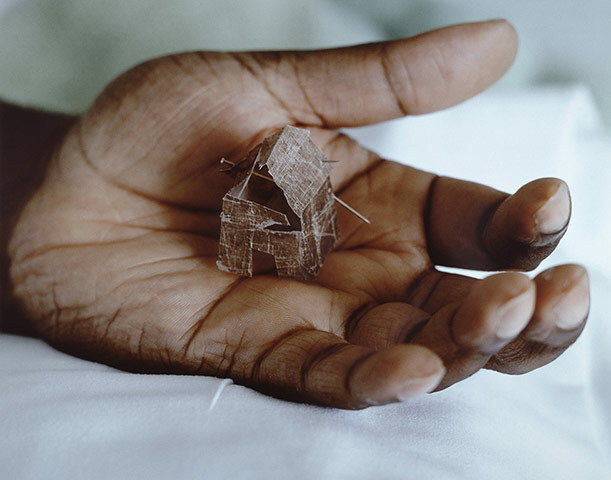 Donald Rodney's (1961-1998) work "In The House of My father", is a photograph on paper. Borrowing from the biblical saying about ‘many rooms in the house of my father’, Rodney showcases the evolution of artists responding to conflicts over migration, race and identity, and these elements go hand in hand with the artist’s personal struggle. In the House of My Father queries what it means to be British. Rodney died young from chronic sickle cell anaemia. He was a prodigious talent and his works are exhibited in the section titled New Black Diasporic Voices. Steve McQueen's Static (2009) is a seven minute still film shot from a helicopter circling around New York's Statue of Liberty, and it brings the "Women escaping the chains of tyranny" with close ups. It is a very powerful take on the politics and policies of the United States. Like languages, diseases and the alphabeth, Static shows that art also migrates through trade, invasion and colonialisation. The film questions fixed and fluid identities, with the sound of the helicopters blades representing US military menace. The illustration of the migrant artists from the Commonwealth from the 1950s to the 1960s probes the questions of the influence of ethnicity upon British art, and its continually shifting demographic art collections. There is Lubaina Himid’s Between the Two My Heart is Balanced (1991). This painting by the Tanzanian-born artist reworks Tissot's Portsmouth Dockyard. Himid got rid of the harbour setting and military male: her women sit either side of a pile of papers – which possibly represent other lost migration. Hamid says that two women in a small boat tearing up navigation charts illustrates the unknown numbers of many who died crossing the water. Juliette Ingrid Goddard MA (RCA) is an art critic. Her artistic talent as a young student earned her a prized place at the Royal College of Art. Migrations: Journey into British Art is created by a group of Tate Curators headed by Lizzie Carey Thomas.